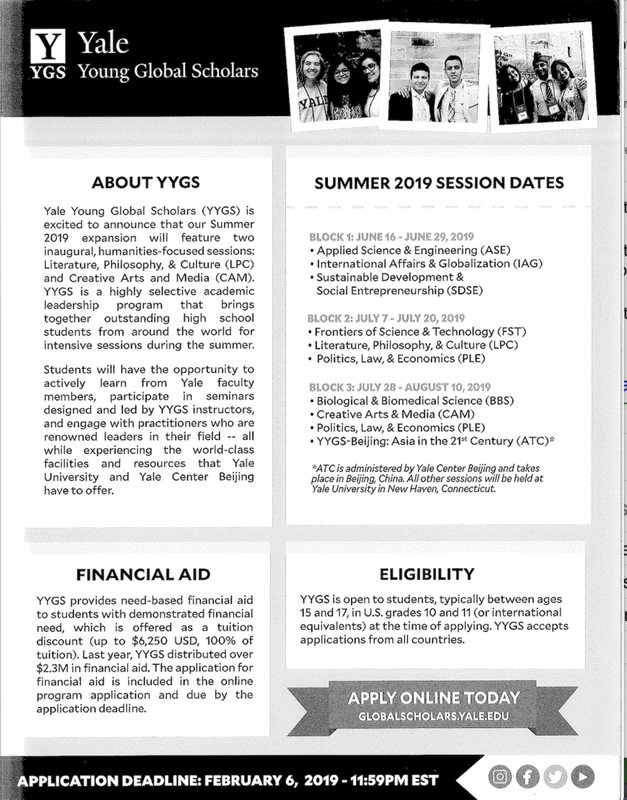 Yale Young Global Scholars (YYGS) is a summer academic enrichment and leadership program that brings together students from around the world for two-week sessions on Yale’s campus in New Haven. YYGS offers need-based financial aid packages to students. In addition, they offer Young Leaders (YL) Scholarships each year to a limited number of students. YL Scholarships are need-based financial packages that cover tuition AND all travel costs. Current 10th and 11th grade students are eligible to apply. You must complete the online application by February 6, 2019. For more information about this scholarship see the attached flyer.